The price I pay for living in an old victorian house is the draughtiness, the doors and windows are so old they don’t quite fit as snuggly as they should. To keep the cold at bay I make draught excluders. 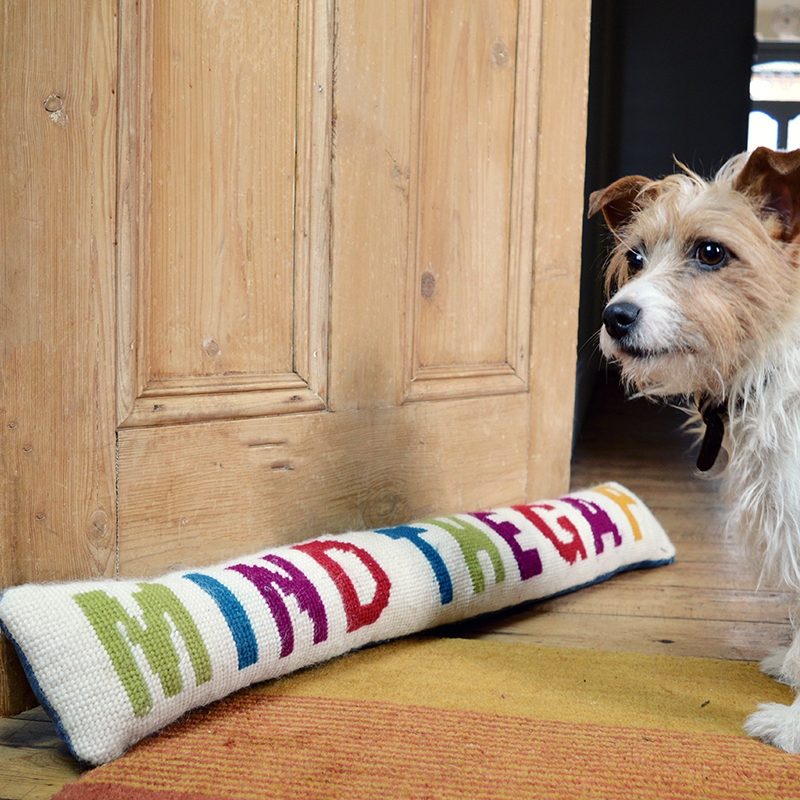 I have made a funky colourful draught excluder stitched on one side with some playful typography “Mind The Gap” and backed in denim. I love using puns and words with personal significance with my DIY crafts. I made a “Sit Down” cushion, not only is Sit Down by James our wedding song but it’s an apt phrase for a cushion. 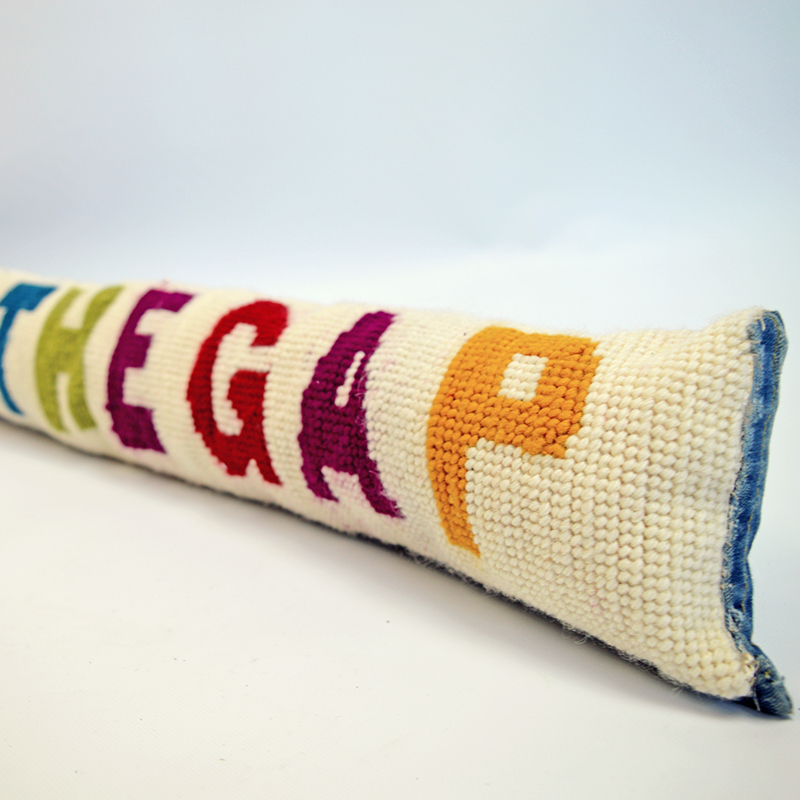 “Mind the Gap” is an audible and visual warning you will hear all the time on the London Underground and I thought this would be great for a draught excluder. 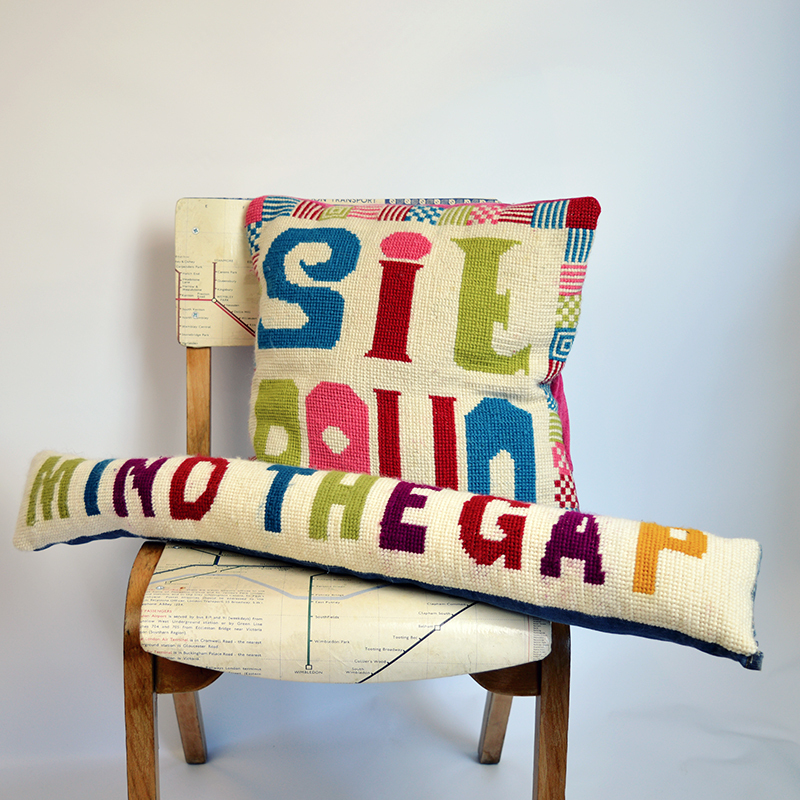 Also it would compliment the Tube Map chair I made last summer. Now you maybe thinking that cross stitch takes too long and is too much of a faff for a draught excluder, however I used supersized and half stitch cross stitch for this project. Not only did this make it super easy, it really speeded things up. Cross stitch canvas 7-8 hpi (holes per inch) 80cm x 15cm approx. I used as Zwiegart Aida canvas. DK (Worsted) weight wool in desired colours. I used approximately a 100g of wool in total for this project. Tapestry needle, scissors & pen. Print out your pattern and transfer or copy it to your canvas. Doing this saves a lot of time as you don’t have to keep counting stitches to work out where you are. 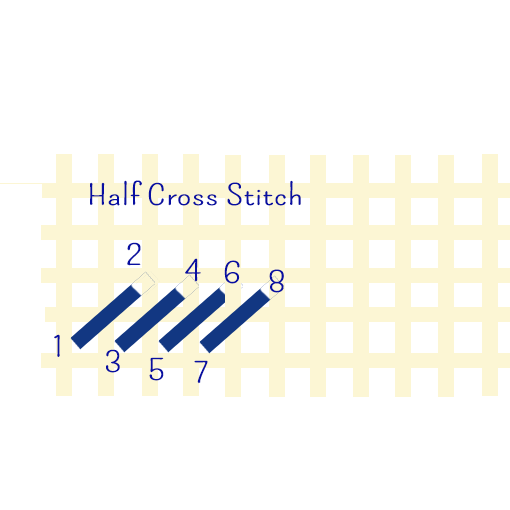 Using your DK wool stitch the pattern with a simple half stitch, make sure that all your stitches go the same way. 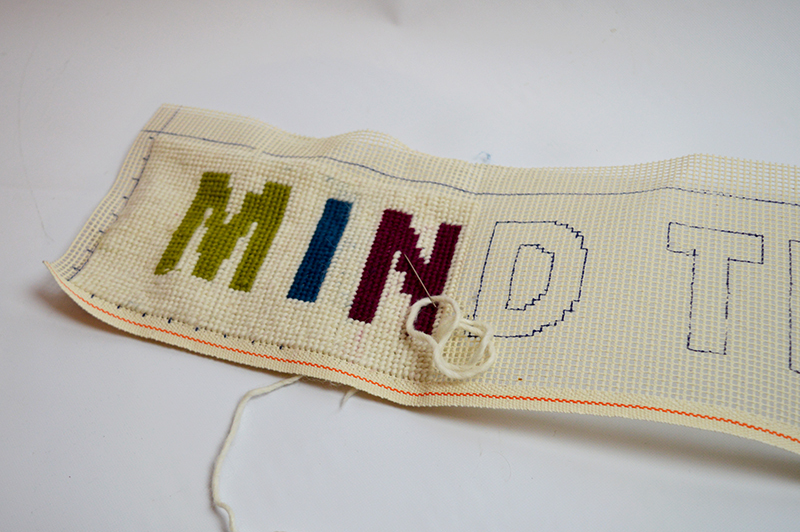 Once your cross stitch is finished cut the excess canvas leaving a margin of at least 1cm all the way round. 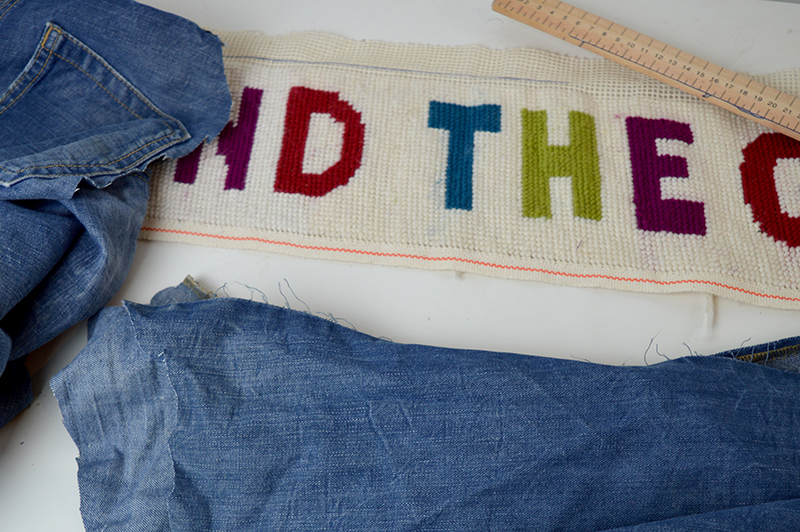 Then cut your denim or fabric backing to the same size as your cross stitch. 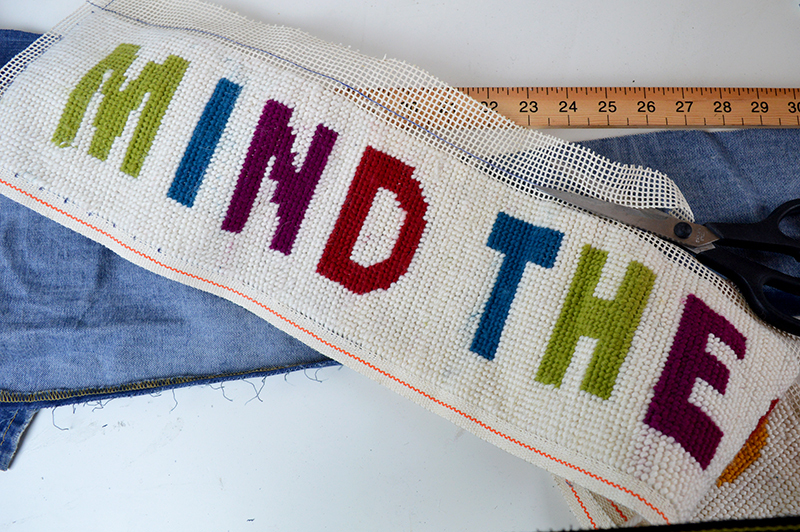 Pin your denim backing and your cross stitch right sides together. 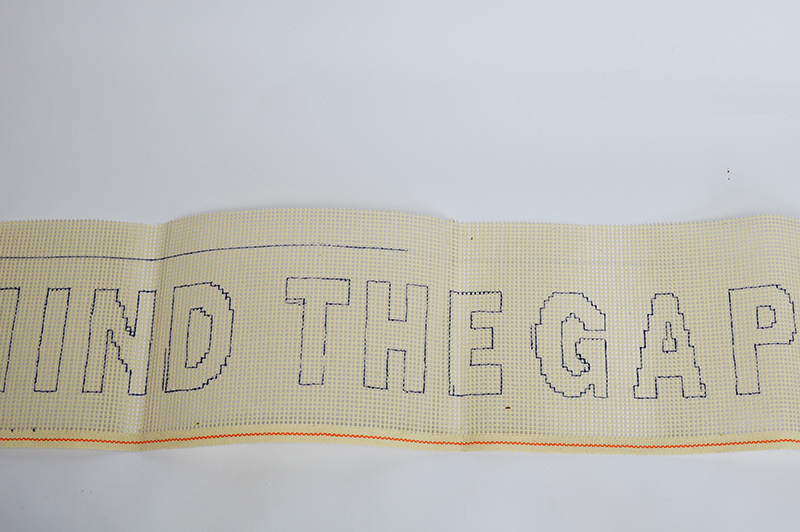 Leaving one end open, sew together to the edge of the cross stitch. 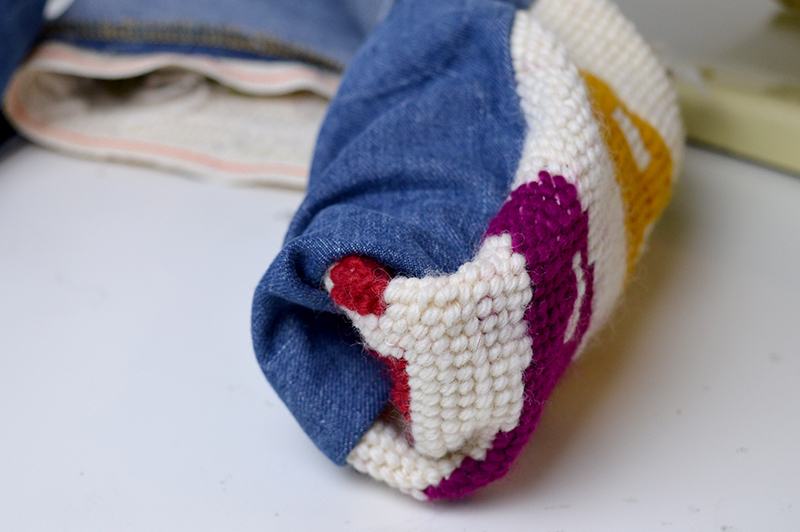 You can either do this with a sewing machine or by hand. Using the open end turn the draught excluder right side out. This will be a little tricky and you may need a long ruler to help you. 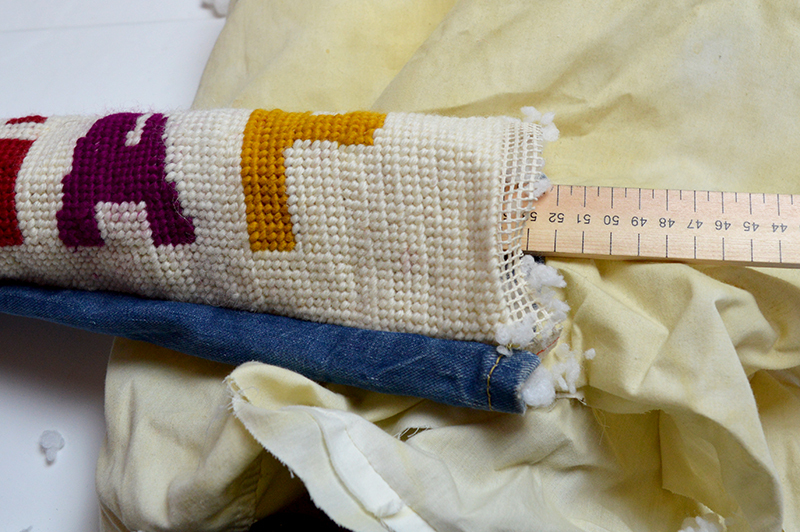 Stuff your draught excluder, you will need something to push the stuffing fiber right down to the end. 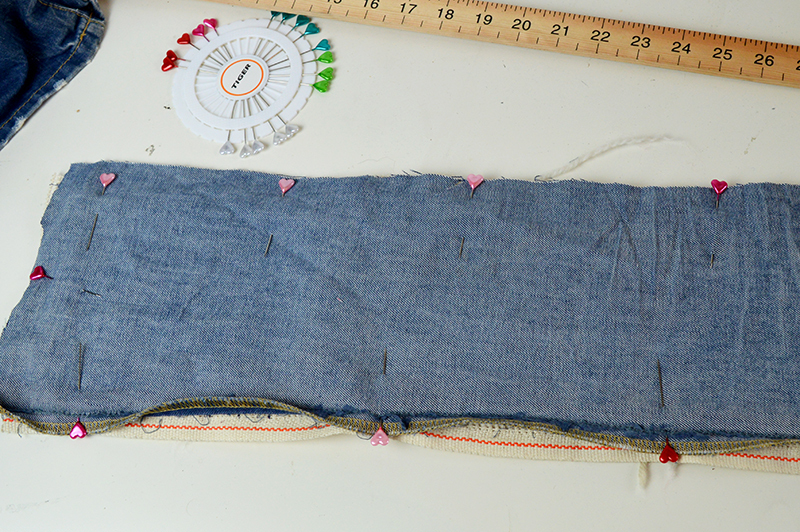 Once firmly stuffed stitch up the open end. Not only are the doors draughty in my house, but I still have the original sash windows which though lovely don’t stop the wind. I therefore make smaller draught excluders for these too. These I fill with rice, or lentils to provide a bit of weight which also stops the windows rattling in the wind. What a great project! It’s always fun when we can take something we love to do and turn it into something useful. Cheers ! i hope you like the rest of the blog. Thanks ! The dog’s called Lottie and just happened to walk into the frame whilst I was taking the photo. After remodeling our home 11 years ago there is no more need for a draught catcher, but I really like yours. I’m wondering if anyone I know might need one. Thank you ! It would make a lovely present. This is so adorable! I could use some of these in my house as well. What a cute idea! I’ve only ever done small cross-stitch, but this looks fun! Thanks for sharing at #HomeMattersParty! Thanks ! 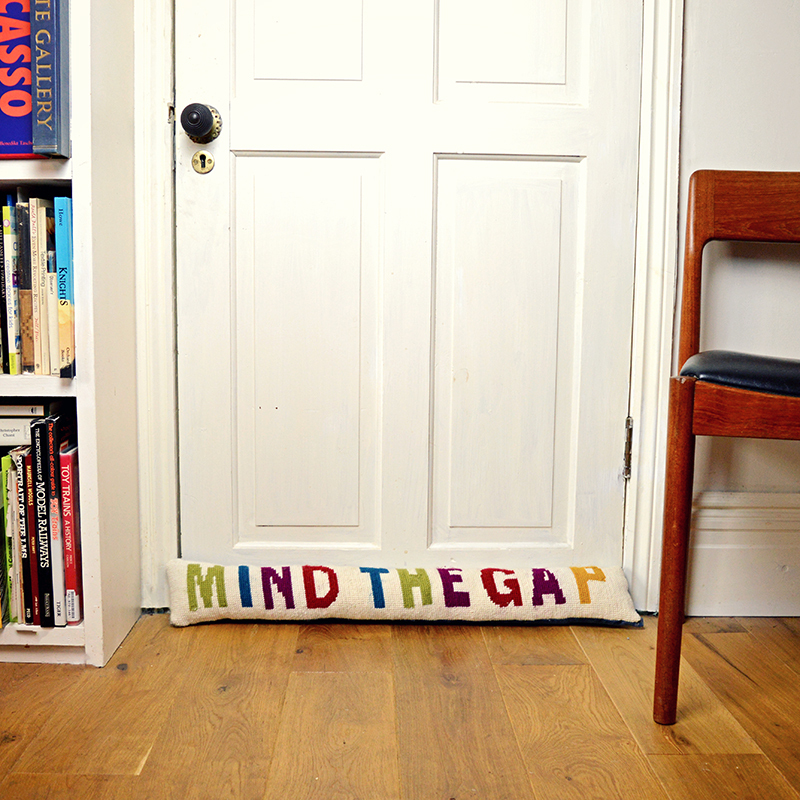 You should definitely give supersized cross stitch, nice and speedy. You are so talented!! This is a wonderful project and I thank you so much for the great detailed instructions. I’m going to be following your blog, great stuff. Thanks again for the good directions. Stay warm. Thank you very much ! Your very kind. 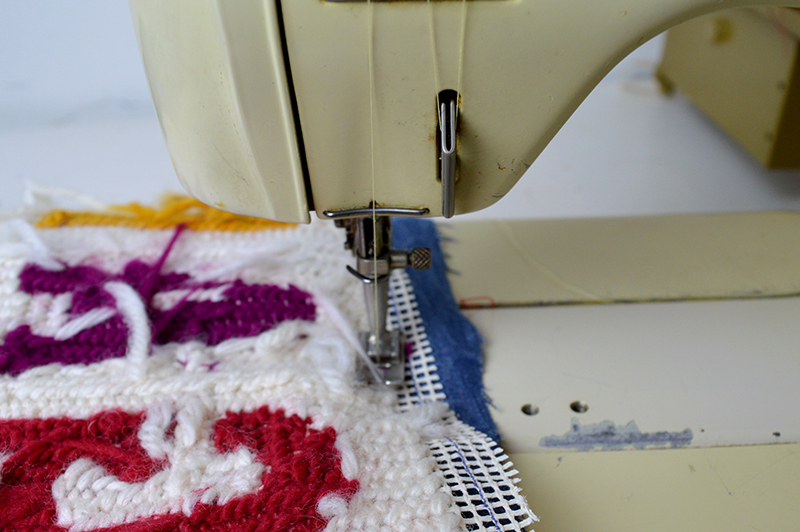 I hope you enjoy the rest of the blog it’s quite varied, I just love lots of different crafts. This is such a useful and resourceful project. I like the up cycling with the jeans too! Thank you ! I always keep old jeans to upcycle ! This is such a fun project. I’m sure we used to call this half cross stitch with thick wool “tapestry” when I was a kid, I remember having a kit to make a picture of a horse! 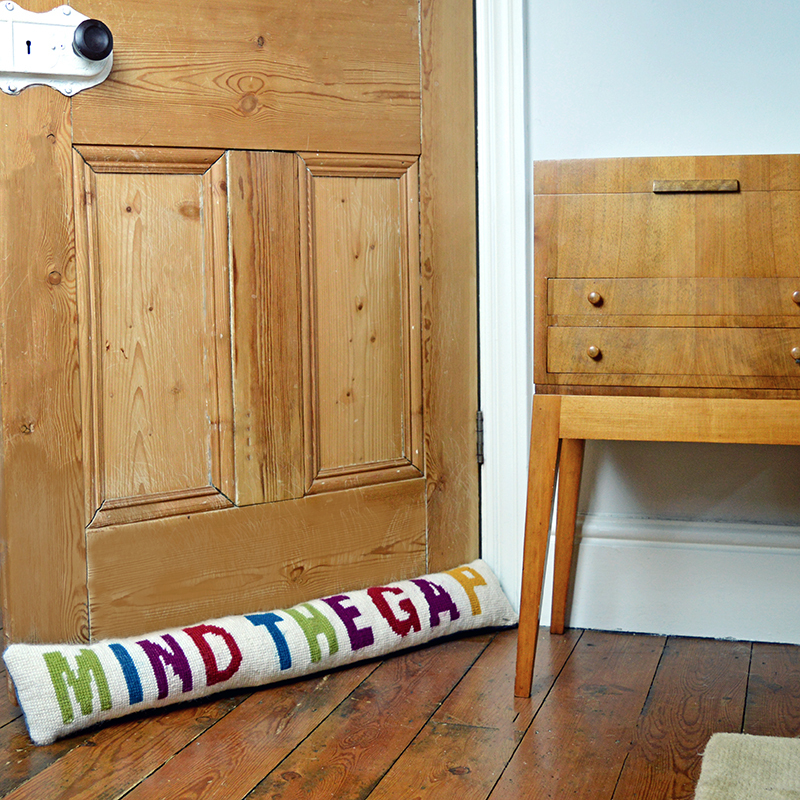 I also remember living in a house when we had draught excluder everywhere – sounds a bit like yours! Good luck and keep warm. Thanks ! I’m never sure what the difference is between tapestry, cross stitch and needlepoint. I love this! I’ve been wanting to get back into cross stitching, but the squares are too small for me to see. This pattern is perfect, and charming too! Thanks for sharing! Yes using a large holed canvas makes it much easier to see and much quicker. These look so awesome. I love the colorful design. Thanks for sharing! Thanks, it’s great to have splashes of colour in the house. So cute! Thanks for sharing at My Flagstaff Home. So cute! 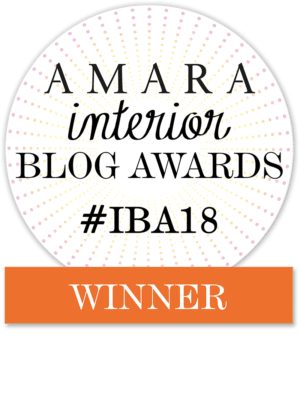 Thanks for sharing your creativity on the Thursday Blog Hop! 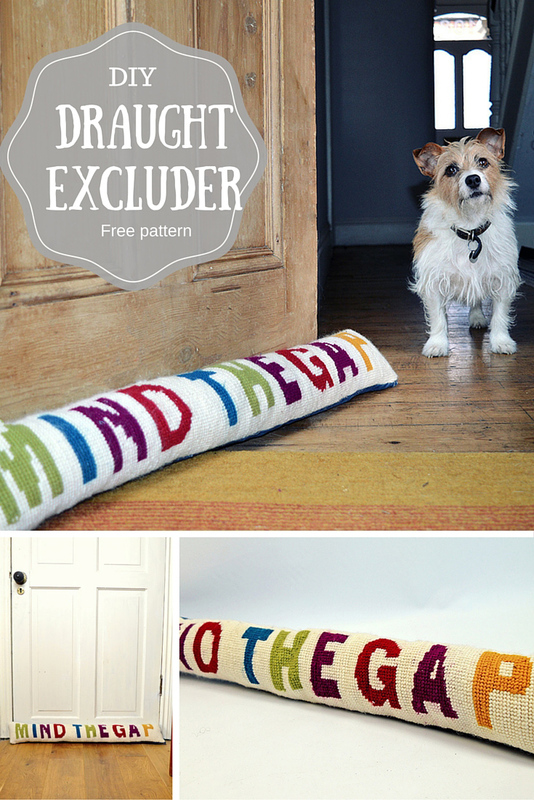 LOVE the idea of over-sized cross stitching. It looks fabulous. Thank you ! It’s really quick too compared to normal cross stitch. This is great!! Inspires me to do something with letters on my crocheting too. The colors are so cheerful, you did a great job! Thank you ! I do like a bit of colour.